Sea Kayaking in British Columbia offers many one-of-a-kind experiences. Kayakers can paddle into a remote Haida beach with 100 year old wooden mortuary (totem) poles or one can sit in a glacier-carved channel among resident pods of Orca "killer" whales. Kayakers can explore hundreds of islands tucked along the west and east sides of Vancouver Island and along the British Columbia West mainland. British Columbia offers sea kayakers miles and miles of undiscovered waters, such as Toba Inlet seen here. Go Northwest! photo by Dave Dean. Columbia also offers Sea Kayakers pristine inland waters (such as Kootenay Lake) for one- or multi-day lake or river kayaking adventures. British Columbia has set aside many of its prime coastal areas as protected marine parks. These protected island groups offer sea kayakers unparalleled beauty, little or no commercial development, rich marine life, abundant animal life and plenty of rugged remoteness to satisfy the most adventuresome spirit. Barkley Sound and the Broken Group Islands part of the Pacific Rim National Park offering sheltered inland destinations, ideal for new kayakers. Expert kayakers head to the western-most islands in this group and may face the full power of the Pacific Ocean. Clayoquot Sound. Located just north of the Broken Group Islands and offering sea kayakers an opportunity to experience the Clayoquot Sound UNESCO Biosphere Reserve. Nootka Sound. Located about 45 miles north of Tofino (above Clayoquot Sound). Sea kayakers in Nootka Sound will experience a sense of isolation and discovery while kayaking in the largest area of ancient temperate rainforest left on British Columbia's Vancouver Island. Gulf Islands. With easy access from Sidney or Nanaimo on Vancouver Island, sea kayakers come to this area to experience warm, Mediterranean-like paddling conditions while exploring some of the hundreds of islands in this area. Johnstone Strait. Located north of the Gulf Islands, in the Strait of Georgia. This kayaking location offers perhaps the best opportunities in the world to observe orca "killer" whales from a sea kayak. Desolation Sound. Located 100 miles (and four ferry crossings) north of Vancouver, BC. This area offers warm (79 degree in summer) Caribbean-like protected waters, bountiful marine life (including oysters and shrimp), and the largest protected marine park in Canada. Queen Charlotte Islands or Haida Gwaii. Located just below Alaska, this collection of approximately 150 islands on the western edge of the continental shelf, exposes sea kayakers to challenging waters and rugged remoteness but temps kayakers with the opportunity to paddle within the Gwaii Haanas National Park Reserve and a world famous First Nations UNESCO International Heritage Site on Anthony Island. Inland waters including lakes, rivers, sloughs and river deltas offering a range of sea kayaking (or canoeing) opportunities. From a gentle paddle on Koonenay Lake or a day trip along a section of the Columbia River the province offers many inland kayaking opportunities. 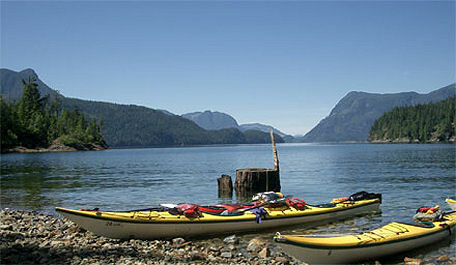 Explore our pages on specific British Columbia sea kayaking destinations - adventure awaits!